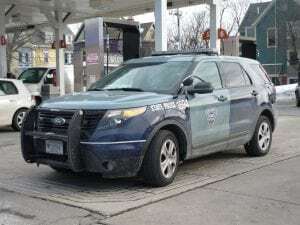 Enfield, NY (October 6, 2018) – State Police are still searching for a driver who fled authorities when they attempted to pull him over. The accident happened in Enfield on Tuesday, October 2 around 6:30 p.m.
Before police attempted the traffic stop, the driver struck another vehicle. They then went on a four-mile pursuit during which the driver struck their second vehicle. The driver then got out of his vehicle and ran into the woods. There was a passenger in the suspect’s van who was arrested and charged with several various aspects. The driver of the vehicle has not yet been found. Police say that the driver of the vehicle that was struck during the pursuit received injuries and was taken to the Cayuga Medical Center for treatment. The investigation continues at this time. We wish to extend our hopeful wishes to the person who was struck during the pursuit and hope that you have a speedy recovery during this time. In some accidents, liability is obvious. Accidents happen on our roadways for a variety of reasons such as speeding, drunk driving, distracted driving, and more. If you believe that somebody’s negligence led to your accident, you have many choices to make as you move forward with your case. Luckily, you are not alone and never have to handle your case on your own when trusted attorneys with experience are on your side. If you believe that you are entitled to damages like medical bills, lost wages, emotional suffering and more, you have a right to speak with an experienced accident attorney in New York who will protect your rights during this time. We are here for you every step of the way at Hach & Rose. Call us today for more information on how we can help you during this difficult time at 212-779-0057.